1. Place all ingredients in a rice cooker. When done, remove from heat and let cool 10 minutes, covered. Set aside. 1. In a small mixing bowl, whisk the mayonnaise, lemon juice, salt and dill. Set aside after mixed well. 2. Place crackers in a food processor fitted with an S-blade and process with seasonings until fine. Transfer to a large plastic bag. 3. One at a time, place the portioned salmon fillets in the plastic bag and toss gently. Make sure the whole fillet is coated generously. 4. Use the vegetable spray to coat a medium-size skillet on medium heat. Place salmon on hot skillet and let cook 1.5-2 minutes per side. Use tongs to gently maneuver the salmon to get all sides lightly cooked. Transfer to lined cookie sheet. 5. Repeat steps 3-4 for remaining fillets. 6. 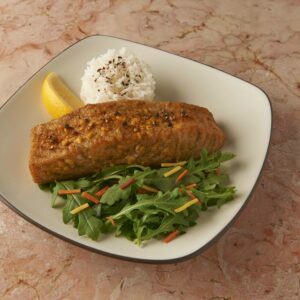 Place salmon fillets in oven to bake for 10-12 minutes. You don't want to overcook them. 8. Serve with rice, side salad and lemon wedge. Manischewitz Creamy Horseradish Sauce with Dill is great on the side.